Guest Post by Hannah Jiam. Ms. Jiam is now a 3L at UC Berkeley School of Law and research assistant with Professor Colleen Chien. The full article related to this post is forthcoming in the Berkeley Technology Law Journal and is available here. It has been a year since the Supreme Court’s decision in Octane Fitness and Highmark, and fee-shifting continues to be a popular issue in patent reform. 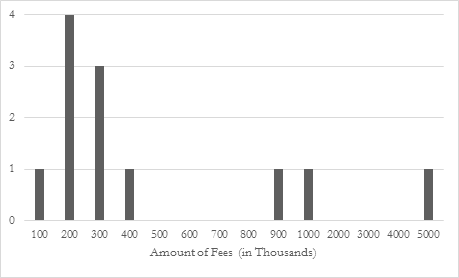 Testimony presented to the House Judiciary Committee on February 12, 2015 discussed the percentage of attorneys’ fees awards before and after Octane. This month, the House Judiciary Committee discussed the fee-shifting provision from the Innovation Act. Congressman Bob Goodlatte, the Chairman of the Judiciary Committee, explained how the bill would “address the issues that businesses of all sizes and industries face from patent troll-type behavior.” Director Michelle Lee of the PTO supported the fee-shifting provisions in the Innovation Act, saying that the “fault based fee-shifting will raise the costs for those who engage in abusive actions.” There have been several articles and papers discussing the impact of Octane Fitness, but none of them provide an in-depth analysis of the district court holdings and the emerging trends post-Octane. I would like to contribute my own research and empirical analysis on the issue. In the ten months following the Supreme court’s holding in Octane, there has been a significant increase in the number of motions made for attorneys’ fees under § 285, as well as the number of attorneys’ fees award to prevailing parties. From April 29, 2014 to March 1, 2015, district courts awarded fees in twenty-seven out of sixty-three cases. This rate, approximately 43%, is at least two times greater than the fee-shifting award rate in previous years. In fact, in the 12 months preceding Octane, only 13% of § 285 motions were granted. 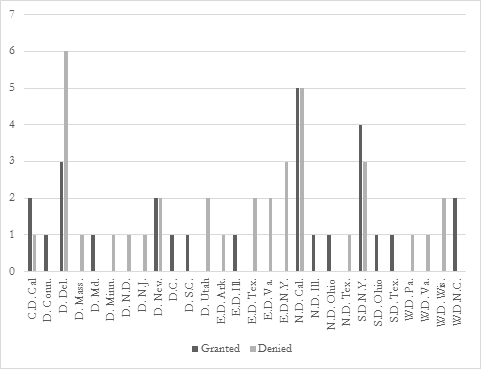 I sorted the § 285 motions granted and denied by district, and reproduced them in the graph below. Although there is not enough data at the moment to make any conclusive determinations, an initial analysis shows that there are certain districts with a higher proportion of cases in which attorneys’ fees were granted than cases where they were not. N.D. Cal. has the greatest total number of § 285 motions granted while D. Del. has the greatest total number of § 285 motions denied. For districts that have decided on four or more § 285 motions, S.D.N.Y. has the highest proportion of § 285 motions granted and D. Del. has the lowest proportion of § 285 motions granted. The majority of the § 285 motions appear to be concentrated in a small number of districts. 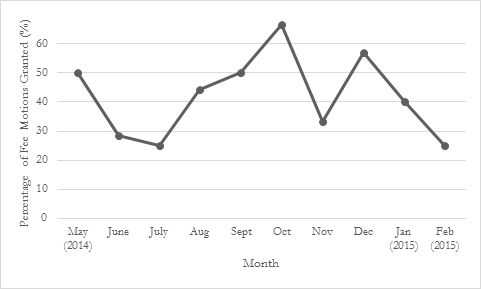 I also examined the percentage of § 285 motions granted over time from April 29, 2014 to March 1, 2015. The variation in the rates between each month could have been a result of any number of variables (such as a district court judge’s availability, the load of a district court’s docket, etc. ), but the percentage of § 285 motions granted each month has always been above the 20% yearly average in 2002 and 2011, and well above the 13% award rate in the 12 months preceding Octane. I created a histogram of the award amounts in cases where the § 285 motions have been granted. Most of the cases have not yet determined the amount of attorneys’ fees to be awarded to the prevailing party, but the majority of § 285 awards thus far have ranged from $200,000 to $300,000. Most courts have specifically limited the attorneys’ fees to the litigation misconduct and apportioned the fees to the “exceptional” behavior. This may explain why most of the fees are around $200,000 to $300,000. Although the Supreme Court stated that the Federal Circuit’s standard was too stringent and inflexible, the Court did not define the standard for an “exceptional” case. District courts now know that an “exceptional” case is not limited to circumstances where there has been “material inappropriate conduct,” or where the litigation is both “brought in subjective bad faith” and is “objectively baseless,” but have little guidance on the actual meaning of “exceptional.” The meaning of “exceptional” continues to vary from case to case, but the Supreme Court’s decision reinforces a district court’s ability to use its discretion when deciding whether or not to award attorneys’ fees in “exceptional” cases. Because the meaning of “exceptional” is still ambiguous and discretion may lead to forum shopping in district where fee awards are more or less likely under § 285, the “exceptional” case standard could benefit from further explanation. Unfortunately, the Federal Circuit’s ability to review a determination of “exceptionality” is limited by the Highmark decision, where the Supreme Court stated that a § 285 decision was a “matter of discretion” and that the exceptional-case determination should be reviewed only for abuse of discretion. Any steps towards further patent reform would be most effective through legislation – Congress can clarify the fee-shifting provision or decide whether or not it wants to maintain an “exceptional” standard under § 285. Furthermore, the Supreme Court’s interpretation of an “exceptional” case places a strong emphasis on the discretion of the district courts despite the removal of the “discretion” element in the 1952 Act. If Congress wants to elucidate or maintain the Supreme Court’s reintroduction of discretion, it should not wait for litigation. Octane Fitness, LLC v. ICON Health & Fitness, Inc., 134 S. Ct. 1749 (2014). Gene Quinn, House Judiciary Committee Questions PTO Director Lee on Innovation Act, IP Watchdog (Apr. 14, 2015), http://www.ipwatchdog.com/2015/04/14/judiciary-committee-director-lee-on-innovation-act/id=56813. Hearing: H.R. 9, The “Innovation Act”, United States House of Representatives Judiciary Committee (Apr. 14, 2015, 2:00 PM), http://judiciary.house.gov/index.cfm/hearings?ID=E71D6951-38DA-42D8-9485-8EC6CE929977. The following numbers were determined using LexisNexis and Westlaw to consolidate all cases from April 29, 2014 to March 1, 2015 involving a 35 U.S.C. § 285 motion. The cases retrieved were checked against a list on the blog Patently-O.com that consolidated several fee-shifting motions post-Octane. The analysis considered factors such as whether fees were awarded, the district, the court’s reasoning, and the award amount. Other analyses of § 285 motion decisions post-Octane have produced similar grant rates. A Comparison of Pre Octane and Post Octane District Court Decisions on Motions for Attorneys’ Fees Under Section 285, available at http://ipwatchdog.com/materials/FCBA-Fee-Shifting-Paper.pdf. Octane Fitness, 134 S. Ct. at 1755. Brooks Furniture Mfg., Inc. v. Dutailier Int’l, Inc., 393 F.3d 1378, 1381 (Fed. Cir. 2005). Octane Fitness, 134 S. Ct. at 1749. (citing Highmark Inc. v. Allcare Health Mgmt. Sys., 134 S. Ct. 1744, 1747 (2014)). Great work Hannah! Thank you so much for putting all this data together. A better way to present Figure 1 is to put the y axis in the middle and have “grants” graph upwards and “denials” graph downwards. 1) 14-1777 Pragmatus Telecom LLC v. Newegg Inc. I believe Lemley was arguing on behalf of Newegg in this case. The issue (and I’m ignoring the apparent factual disputes between the parties): can a defendant in a patent suit that has been dismissed with prejudice by motion of the plaintiff, but without any findings of validity or non-infringement by the judge (discovery was ongoing), be properly deemed to be a “prevailing party” in that suit? The district court said “nope” (there are more facts in play … trying to keep it succinct here). The attorneys for both sides did a fine job of presenting their cases and the judges seemed very engaged and interested in the issue (that’s most definitely not the case in every oral argument!). 2) 14-1552 DCT Action Star Enterprise Co. v. KaiJet Technology Intl. This was a case where the plaintiff is disputing the amount of fees awarded to the defendant after summary judgment of non-infringement (and following the Supreme Court’s ruling in Octane Fitness). Listen as the attorney for the winning party gets lambasted by one of the judges (Wallach? 15:00 into the recording) because, apparently, (1) the judge couldn’t believe that it could cost anyone half a million dollars to tank a case as poor as the case brought by Action Star and (2) the judge was plainly frustrated by sloppiness in the defendant’s briefs. In the instant case, KaiJet asked Action Star to produce any evidence in support of its infringement allegations, but Action Star did not produce any and said proof of infringement was in KaiJet’s control, the judge said. Months later, however, Action Star produced … YouTube videos and a declaration of an Action Star employee in response to KaiJet’s motion for summary judgment. The claims asserted by Action Star, by the way, are among the worst ever granted by the PTO. Thanks for this useful and interesting data.